When the audience doesn’t get your message, why not “send the text to Hollywood”… An idea almost as old as engineering itself. Even in the past, movie components boosted transparency and accelerated the mass adoption of new technologies, or logic, that had seemed too black-box before. E. A. Link launched the first commercially available flight simulators, called the LinkTrainers. They became efficient tools to teach flight and to show the behavioral “logic” of an airplane to novices and junior pilots, in a safe setup (on the ground). By WWII, Link delivered over 10,000 and they became standard equipment at every air training school, for pilots from all Allied nations. E. W. Dijkstra laid the foundation of structured programming, software architecture, and algorithm visualization. Also, he pointed out the limited ability of (static) lines of code to make (dynamic) behavior clear, and he realized the expressive power of visualizing it dynamically; put together, this paved the road to animators. Algorithm-independent animators started to emerge as lab tools and research papers. Most of them animated source code, highlighting it line by line during test execution. In 1988, I worked with senior consultant Leif Carlson of Jackson Systems International on the integration of the first PC-based code animator off-the-shelf (by Micro Focus UK) with a Swedish modeling tool and code generator, the JSP-Tool. The AnimatorLink made it possible to animate behavior both as diagrams and as lines of generated code, in sync, on one screen. It improved design transparency as well as testability. Animators rolled on, into Business Process Modeling as well as into technical documentation in manufacturing where they complemented CAD and knowledge-based tools, especially in automotive electronics and in other sectors where electronics augmented many (mostly mechanical) components. Animations turned out excellent to teach senior staff, such as mechanics or drivers, “why a modern engine works at all”. UML 1.0 was adopted as a standard, which channeled more animation effort into UML modeling. Among the first off-the-shelf animators using UML were Rational/RT, and Select Business Solutions UK (I often demonstrated Select’s Object Animator at my public UML courses, to underline behavior in the pre-SOA era). UML 2 gradually became a standard in 2003-2005. 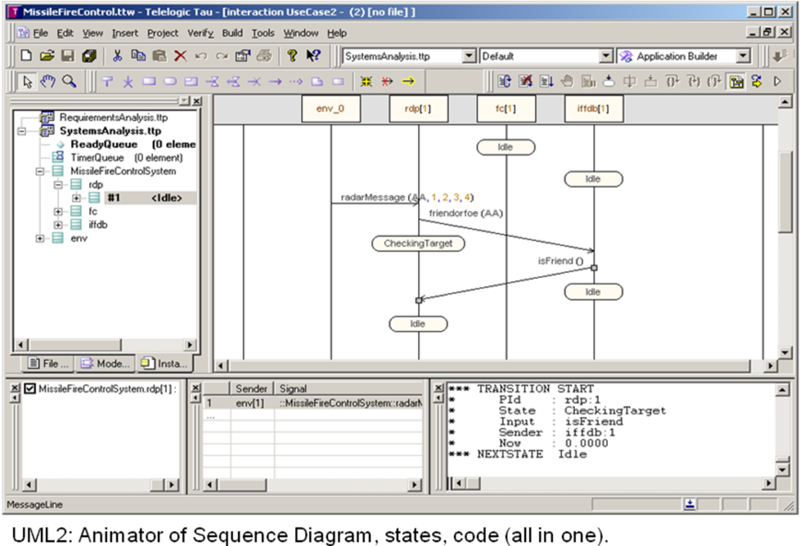 TeleLogic in Lund, Sweden, offered animation of UML2 Sequence Diagrams, states, and code, all in one partitioned window. Architects, testers, and devs could use a Sequence Diagram animator as an interactive tester GUI, among other things. A beta was available already a year or two before UML 2 took its final shape. Some organizations I’ve advised on architecture and modeling over the past 5-10 years leverage user-story or use-case animations to communicate their architecture (ITA, EA, SA, or even legacy system portfolios) to a variety of roles and backgrounds. If you’re in a primarily-tech business, you can animate some of the UML (or SysML) behavior diagrams, off-the-shelf. Whereas, if you’re in finance, government & administration, or care, with many non-technical roles, then it’s best to go for one type of diagram throughout (which means, even in animations). Often, a layered UML Component Diagram (sometimes nicked “architect’s diagram”) is agreed upon; however, most UML modeling tools animate behavior diagrams, so with other diagram types (i.e. with structure) it’s practical to hire someone with a very versatile animator tool to “project” your scenarios directly onto your structure. History tends to repeat itself. In navigator training, some simulators for WWII flight schools could play a sequence of ground photographs (e.g. an approach route), like a movie in the navigator’s “window”. The instructor kept, manually, the “ground movie” in pace with the speed indications on dashboard; to the trainee, it looked very similar to flying across the terrain. In my previous blogpost, I mentioned that appropriate technologies, practices, and built-in mechanisms for auditability, comprehensibility, predictability, traceability, and testability/V&V are top of the AI agenda. As soon as the opaque logic generated in deep neural networks (in their training phase) can either be unpacked afterwards, or structured upfront during training (into rules or trees or case bases), it’s high time to animate or trace various scenarios through that logic. Just like in animations in the past, this will clarify things to stakeholders, non-IT roles, trainees, or new employees.